Might you have chosen to postpone your catastrophic death spiral until later this month? While I appreciate that you were willing to come up for air long and often enough for me to rescue some highly important files, holding off on your dramatic failure would have been even nicer. I was going to say, that's an ooooold iBook, back before the days of sans-serif logos. Josh! 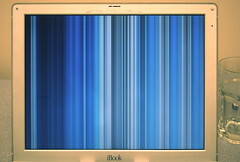 My PowerBook died last night! I think your iBook gave it the digital clap or something.